Q: I filed for bankruptcy in 2003. I really don’t want to file again, but I need to get rid of this debt. Where do I start? A: To dig out of debt, start by admitting that you have a serious problem managing your finances. You acknowledge having filed bankruptcy nearly seven years ago, and now you are back in the same situation – deep in debt, and considering bankruptcy as one of your alternatives. I don’t have to tell you that you shouldn’t go back down that road (i.e. filing bankruptcy again). You already know it. No matter what the reason you got back into debt this time – even if it was because of something out of your control – like big medical bills, divorce or the loss of a job – because of your past, you would have been wise to build up a cash cushion and take other steps to safeguard your finances so you’d never slip into debt again. However, you’ve clearly not done this. I don’t mean to lecture you — especially since I’ve had more than my own share of debt. But I do want you to recognize that until you can conquer the reason that you keep falling into debt, you’ll be doomed to repeat this vicious cycle again and again. Are you simply a poor money manager because no one has ever taught you the basics? Like how to balance a checkbook, how to manage debt wisely, and when (and when not to) borrow money or use credit? If you feel you lack basic financial literacy, then your next step is to be proactive about educating yourself in the areas where you are deficient. Read magazines or personal finance books. Take a free budgeting course at local community college or online. Or simply ask for advice from a mentor or someone around you who is successfully managing their finances. 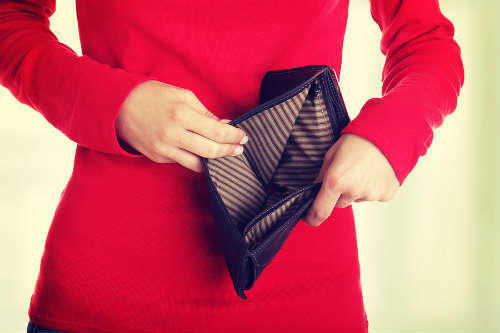 Are You a Chronic Over-Spender? If So: Why? For many people, though, staying out of debt isn’t really about a lack of education. Many of us know that we shouldn’t go out and run up the credit cards – yet that is exactly what we do. Many people deep in debt are not just poor money managers; they are chronic over-spenders. For these individuals, staying out of debt is often about changing your mindset. You have to get comfortable with the fact that you can live without credit – and life will be just fine! Yes, you will have to take fewer trips and vacations. Yes, you will likely spend less time – and less money – at the mall. And yes, you will have to put an end to trying to “keep up with the Joneses.” If you can wrap your head around doing that, and put an end to the over-spending, every facet of your life will be enriched – not just your bank account. My book, Zero Debt: The Ultimate Guide to Financial Freedom, discusses how I got into and out of $100,000 in credit card debt. It offers specific “how-to” steps for those struggling with credit card bills. Read that book as a roadmap to debt-free living. But again, there’s a difference between “book learning” and putting something into practice. Zero Debt can point you in the right direction. It can give you valuable, practical, tried-and-true steps to eliminate debt. But only you can implement that advice and put it into effect in real life – hopefully, for the rest of your life.